I am continuing to add to the web site. Yesterday I added some patterns from KnitSpot. Ann Hanson is a very talented designer. I have knit a couple of her designs, her patterns are well written and complete. I added a bunch of sock patterns that look interesting. I am not much of a sock knitter, but there are a couple I would consider knitting, such as the Lighthouse Gansey and the Hayrick. Check them out. Right now I am knitting a pair of her Spiraluscious mitts and plan to do a pair of the Snow on Cedar Mitts for a Christmas gift. The other area I am updating is the knitting needles. I am adding bamboo circulars from KA, a Japanese company. The needles are great quality at a very affordable price. I have not been doing a lot of dying. I did dye 10 skeins of Mary this week to restock. What I really need to do today is mix dye stock as I am low or out of a lot of colors. Everyday I am amazed and pleased with the results of dying yarn and fiber. Sometimes it does not come out like I expected but is beautiful. And other times I throw it back in the dye pot to change it. 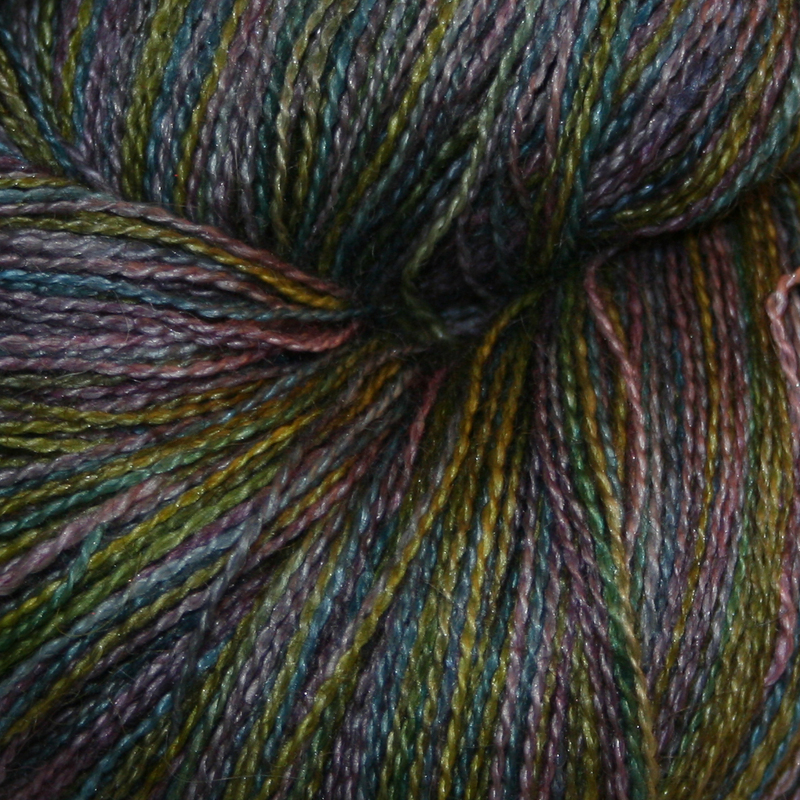 Here is a picture of a skein of my lace weight yarn, Ida. This originally was a bright, almost candy, color combination. I overdyed it with Raven and it made the colors richer. I call it Night Lights. I may end up doing something similar to other skeins of yarn I do not think will sell because of how the colors or color combinations came out. This is a craft and I know I have learned a lot but have much more to learn. I am enjoying it though. It is cold in New Hampshire. This morning there is ice on the fish pond. The fish have been slowing down for weeks now. I was surprised when I was cutting back the overhanging hostas last month when I discovered a baby had been born during the summer. He was already about 2 inches long so had been hiding for a while. He is now hanging out with the big fish.